On Monday, May 30, 2011, a special chicken died. Her name was Katie. A veterinarian estimated that she was six years old. Katie was brought to Safe Haven three years ago by a young couple who had purchased her at a live meat market. They wanted Katie to be their pet. But their landlord objected, so they asked us if we would take her. Right away we noticed how the other chickens liked being near Katie, and she often tried to protect the others. One day we needed to administer medicine to Katie and a bantam rooster named Burdock. Katie didn’t like being held to have medicine put in her mouth, but she let us do it. But when we tried to treat Burdock, he squawked loudly and flew about, trying to escape us. Finally he ran up against a fence. It appeared that his escape routes had disappeared. At that moment, Katie ran over to Burdock and put her body in our way. It was clear to us that she was trying to defend her friend. Some of my other memories involve Katie and two partridges who had escaped a nearby hunting club and had moved into Katie’s aviary. They were shy but soon began sleeping on the roost next to Katie. 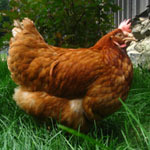 They also ran over to Katie when they were frightened, burying their heads in her feathers for protection. One day a partridge wandered outside the aviary and seemed afraid to re-enter because of my presence next to the screen door. Katie walked out of the aviary, approached the partridge, and then walked back into the aviary. The partridge followed her back in. The most surprising behavior I saw occurred one afternoon when I was upset about a personal event. I felt a little like crying as I entered the aviary. Katie walked directly toward me, looked directly into my eyes, and sat quietly beside my leg. I felt sure she was trying to comfort me. We often hear the term “mother hen,” but I never knew how caring and protective a hen can be. All of us at Safe Haven will miss Katie very much.